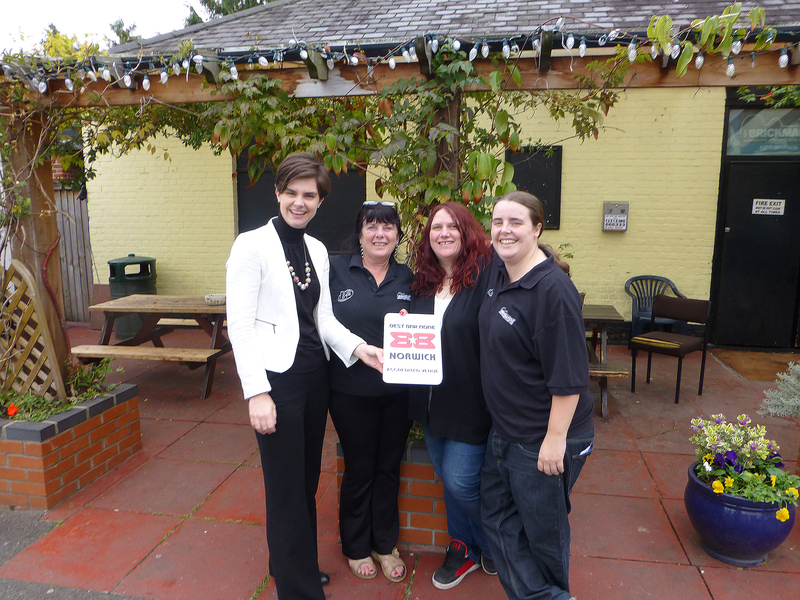 Thursday 11 October was a landmark day for Best Bar None Norwich in that the first two scheme accreditations were presented, to OPEN on Bank Plain and the Brickmakers Arms on Sprowston Road. Shortly afterwards scheme managers Steph Butcher and Glenn Hoy were off to London to attend a Best Bar None National presentation at the House of Lords. The first award was given to Sarah Minty, the Principal of the OPEN Youth Trust by local MP Chloe Smith. Sarah told us, “The OPEN venue is delighted to have been awarded Best Bar None Norwich Accredited Venue status because it recognizes our commitment to promotion a safe and entertain night out in Norwich. The group then moved on to The Brickmakers to present Pam and Charley South and Emma Teasdale with their well-earned award. Best Bar None Norwich recognizes high-level practices in licensed premises, by way of venues achieving accreditation in key business criteria such as: security, drinks & drunkenness, drugs, public safety, first aid and fire and building safety. The outcome is that Best Bar None Norwich accredited venues will help make Norwich a safer and more enjoyable place in which to enjoy a night out.